Steve here. As some of you know we have a portion of the show called “Build Me A Song” where I invite some folks up from the audience to help us build a song. It’s always a hoot and on this particular night in Austin I had a young man, Kenny Finkelstine come up on the stage. He was an exceptional participant who wore a tremendous smile the whole show. Sometimes I drape my guitar around song participants and play it and Kenny was a great sport about it. 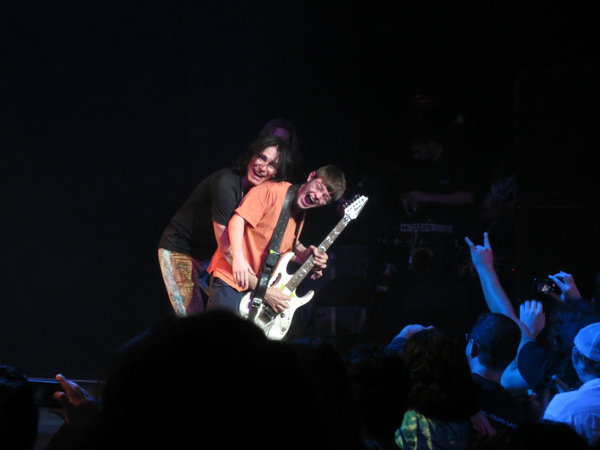 Here’s a fun shot he sent to the Vai concert review forums.